Extensive and growing employment opportunities, for Capesize and Panamax bulk carriers, are reflected in the huge investment interest shown by shipowners. The range of commodity trades, in which these ships are employed, is more restricted than that available for smaller tonnage. But the sheer size and expansion of trades in which Capesize and Panamax vessels perform their vital role continues to dazzle. These characteristics have resulted in massive global fleet expansion during recent years, which is now slowing noticeably. Over the five year period from 2009 to 2013, the Capesize fleet slightly more than doubled in deadweight capacity, while the Panamax fleet expanded by almost two-thirds, both remarkable achievements. Although the gearless Capesize ships depend chiefly on iron ore and coal trade for employment, these movements, the two largest individual commodities, have seen very strong growth. Panamax bulk carriers, most but not all of which are also without cargo handling gear on board (gearless), are also heavily dependent on iron ore and coal. However, there is a much broader range of commodity trades in which they are often employable, including grain/soya and within the minor bulk sector. larger than five years earlier at the start of 2009. Annual growth rates were very strong in the first three years of this period, varying between 19% and 23%, but have since slowed sharply to only 5% last year. The Panamax bulk carrier fleet in the 65,000dwt to 99,999dwt size group, which includes the Kamsarmax sub-group, grew by about 63% during the same period of five years.At the beginning of 2014 this fleet reached 185.5m dwt (2,354 ships), a 71m dwt increase. Fleet expansion was greatest between 2010 and 2012, when it was 12–13% annually, after which there was a deceleration to about 9% last year. In both size groups a further slowdown is now unfolding. Estimates for 2014 as a whole depend upon assumptions about newbuilding deliveries and scrapping: these key influences are not easy to forecast accurately. Nevertheless, it seem likely that the Capesize fleet’s growth rate will be reduced to about 4% this year, while the Panamax fleet could see about 7% growth. Lower newbuilding deliveries are the principal reason for expecting a further moderation of the heady capacity expansion seen in recent years. This great enlargement followed the enormous volume of orders place during the earlier boom period, reinforced by a subsequent ordering upsurge in 2010. The result, despite higher scrapping of old tonnage, has been a much faster pace of fleet capacity expansion than required. Order books for newbuilding bulk carriers, at shipyards around the world, have been greatly reduced as deliveries outpaced the inflow of new contracts concluded. This feature is expected to ensure that, at least in the current year, deliveries continue on a downwards trend. Assuming that scrapping remains relatively high as well, estimates of slower Capesize and Panamax fleet growth are the outcome. But there is always a possibility that changes in market sentiment and expectations will invalidate such calculations. Already, a more optimistic market view, adopted by many shipowners and operators, apparently is contributing to less incentive to arrange demolition sales. It has also encouraged a distinct pick up in ordering new ships for delivery some time ahead from 2015 onwards. Steel mills and power stations provide a large proportion of employment for Panamax and, particularly, for Capesize bulk carriers. Iron ore and coking coal used in steelmaking, and steam coal used in electricity generation plus other industries which include heat processes (such as cement), are key commodities traded worldwide. Capesize tonnage is almost entirely dependent on movements of steel industry raw materials and steam coal. In addition to participating in these commodity trades, Panamax vessels are extensively involved also in the transportation of grain and soya, while also carrying large amounts of other ‘minor’ bulks including bauxite/alumina for the aluminium industry. In the past three years world seaborne iron ore trade has exceeded 6% growth annually and, in 2013, totalled over 1,200mt (million tonnes), as shown by the table. Most of the additional volume seen during this period was contributed by China’s strongly rising import demand. Other major importers, mainly the European Union, Japan and South Korea together provide only limited extra quantities over the period as a whole, and in some countries in some years there were negative changes. China is the dominant importer of iron ore, comprising two- thirds of the global iron ore trade total. Last year’s volume was a vast 820.3mt, resulting from a large 75mt or 10% increase compared with the previous annual amount.This expansion was supported by higher crude steel production, up by 8% at 779mt, a figure which probably will be revised upwards significantly when more accurate figures are available. Japan also saw increased iron ore imports last year, when there was a 4% advance to 136.5mt. The European Union’s volume may have risen by about 2%, to reach 101mt, while South Korea’s quantity by contrast was 4% lower at 63.4mt. World seaborne coal trade averaged over 7% growth annually in the past three years, reaching almost 1,200mt in 2013, as also shown in the table. The largest element is steam coal, comprising about three-quarters of the total, with coking coal forming the remainder. Expansion of steam coal import demand at a 9% annual average contributed most of the overall growth. Coking coal trade grew at 5% annually. The positive influences affecting coal trade’s enlargement were much more broadly spread than seen in the iron ore segment. China’s additional coal import volumes were a substantial part of the expansion, but many other countries contributed with sizeable increases. India’s very large rises formed an especially prominent trend, accompanied by growth in Europe, Japan, South Korea and Taiwan as well as smaller importers. In most of the bigger importing countries it was extra steam coal purchases which mainly resulted in higher overall quantities. Global grain trade (including soyabeans) has also grown over the past three years, at an estimated 4% average rate, reaching almost 340mt in 2013. Year-to-year changes are often characterized by a very variable pattern, which has a substantial unpredictable element. This pattern reflects the impact of weather conditions on crops. Domestic harvests in importing countries vary greatly because of changeable weather and, in turn, this affects purchases of grain from foreign suppliers. Amid these variations, one trend has provided a consistent growth element over many years. China’s imports of soyabeans grew in most years, reflecting rapidly increasing consumption. The rising usage was directly translated into import demand because China’s farms produce only a relatively small quantity. In the minor bulk segment numerous individual global commodity trades are actually large and have increased greatly in recent years. But some mainly employ ships in the Handysize and Handymax size groups. Although Panamax bulk carriers also have a significant role carrying a number of commodities, Capesize employment is very limited. Bauxite and its processed form alumina is a prominent part of this sector. Seaborne movements of this aluminium industry raw material are estimated to have reached about 140mt in 2013, after averaging 14% annual growth over three years. Much of the expansion was caused by a huge upsurge in China’s imports, which totalled over 75mt last year, more than doubling within the period. Forecasts of global seaborne commodity trade in 2014 (see table) point to solid rises in iron ore and coal movements, assuming that China’s import demand trend remains strong. Expectations of improving economic activity in a number of countries suggest a positive background for trade. Grain and soya trade prospects after mid-2014 are more difficult to assess, because unpredictable summer harvests in northern hemisphere importing countries will be influential. Additional minor bulk cargo volumes are foreseen. During the later months of last year and early part of 2014, perceptions of an evolving pattern leading towards an improved freight market balance in the bulk carrier sector were reinforced. In particular, a boost was received from several spikes in Capesize rates, bolstering the overall market tone. These temporary improvements appeared to suggest that much of the capacity over-supply which has been a feature in recent years is being absorbed. 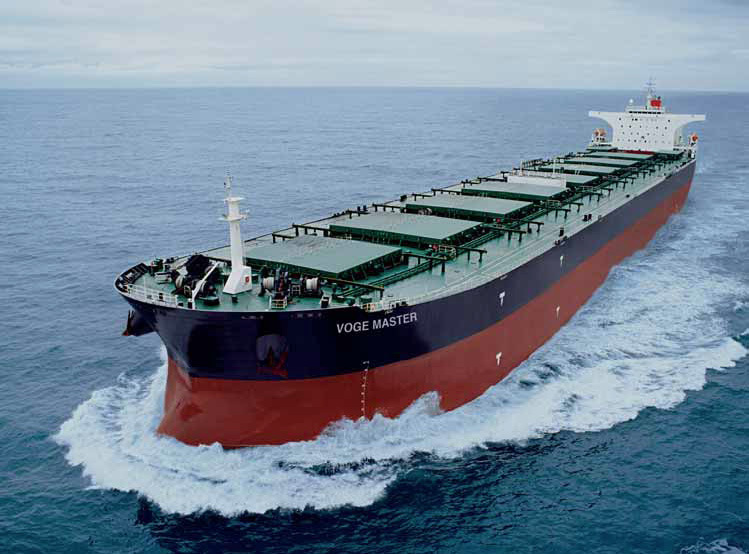 But growth of carrying capacity in the Capesize and Panamax size groups, and indeed in the world bulk carrier fleet as a whole, is likely to remain quite sizeable over the next twelve months and possibly further ahead. Consequently, there is still a heavy reliance on substantial additional tonnage demand emerging, and especially on rising dry bulk import volumes. An expected further robust increase in China’s commodity imports is a crucial element, assisted by higher import requirements in other countries.